I’ll spend little time on stage this month, however my music will be there for me, mainly for theatre performance. It will side with nine contrasting energies pieces scattered across twenty cities and some fifty shows that will sometimes disconcertingly reflect each other. On the 1st, to set up a place where music and poem should become one, we will be on the stage of Nuithonie with Claire ingrid Cottanceau and a new choir of twenty elders for Nova Oratorio. The slow unfolding of time will have nothing to do with the accent no more than the lengthening of days with longitude, even if we’ll be in Switzerland, more precisely in Fribourg. On the 3rd, at tea-time, an invisible but coloured fog will form upon the Commanderie des Templiers in Saint-Quentin-en-Yvelines where Claire ingrid and I will feed each other back for an ad-lib based on our ongoing work about Rothko, as part of the photo-kinetic exhibition by our comrade Dan Ramaën, running until the 10th. From March 12th to April 3rd, a pressure, atmosphere and instruments change. My compositions for five clarinets among which two bass ones –interpreted by Jon Handelsman- will accompany the emergency of Édouard Louis’ text, Qui a tué mon père ?, a cathartic J’accuse performed and staged by Stanislas Nordey at the Théâtre de la Colline in Paris. A forceful and watered play elevated with a final punch. 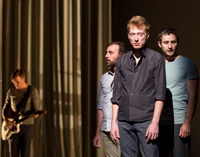 From father to mother, some common sorrows, an equal absence but other remedies, three musicians and three actors under the chopping sun of Face à la mère by Jean-René Lemoine and staged by Alexandra Tobelaim for a Provence quartet: in Cannes at the Théâtre National on the 8th and 9th, in Nice at the Salle Obino on the 12th Vitrolles. Then here comes the son, Le Fils from the Unijambiste troupe, with a text by Marine Bachelot Nguyen, superbly interpreted by Emmanuelle Hiron and cut off by a telluric harpsichord take-off -by Bertrand Cuiller himself- just like a flood of acid hail that will clear the backward ones of ‘La Manif pour tous’-French opponents of gay marriage and adoption. In Rouans on the 2nd, in Coutances on the 5th, in Lisieux on the 7th and for a month in Théâtre du Rond Point at the Théâtre du Rond Point from March 19th to April 14th. Farthest North, the word will give way to the digital mist of Mirages & Miracles by Adrien M and Claire B who will wrap the Espace Legendre in Compiègne from March 5th to 30th, where the water from Acqua Alta will rise on the 5th before streaming down to Lyon on the 8th and flowing up to Douchy-les-Mines on the 15th. 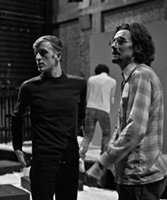 With Ersatz by Julien Mellano, the Compagnie Aïe Aïe Aïe will see to disturb the cloud computing on Breton land in Lamballe on the 1st, in Le Vieux-Marché on the 2nd, in Auray on the 22nd and 23rd for the Méliscènes Festival, whereas the stormy-filled clouds of Fulmine by Charlotte Blin will darken the Vienne skies on the 6th and those of Thann on the 8th. Away from the theatrical whirl, I’ll lead again the Domptage du vide et capture de l’éther workshop for the Literary creation master’s degree registered students in Le Havre. In keeping with tradition, when returning from the diving unto these non-narrative oceans, the tomorrow’s writers will share their nuggets during a public appearance in Fort de Tourneville at PiedNu on the 13th. March stuffed with words and during which we’ll win two sunrise hours, we’ll celebrate Casimir or Joao de Deus, π, Shuni-e, Hōnen Matsuri, Sikh or Malagasy New Year, Holi, Hola and a thousand different things. March filled with the word, getting into line towards spring, before April finds the music line again.